Turtle Airways have this confidence in their seaplane flights: Once you’ve experienced it, you’ll never forget it. Castaway Island Resort shares this ethos, and is proud to have been presented with numerous international travel awards over the years to back up their commitment to excellence. As your plane descends towards Castaway, you will be struck by a sense of enchanted remoteness and solitude – dense rainforest blankets the whole island, it is the very image of tranquil isolation. Castaway Island Fiji is equally as confident of its ability to provide romantic escapes for couples as it is at providing action-packed fun family holidays. One activity of note is the Island Hop Excursion during which guests are whizzed around the Mamanuca Islands on the Teivovo Speed Boat. Fans of the Tom Hanks movie ‘Cast Away’ will be thrilled to take a speed boat trip to Monuriki Island where the movie was filmed. Be sure to keep your eyes peeled for the intrepid Wilson bobbing in the surf! Traveling to Castaway Island from Fiji’s mainland is like retreating into a lost world of enchanting natural beauty and contemplative seclusion. 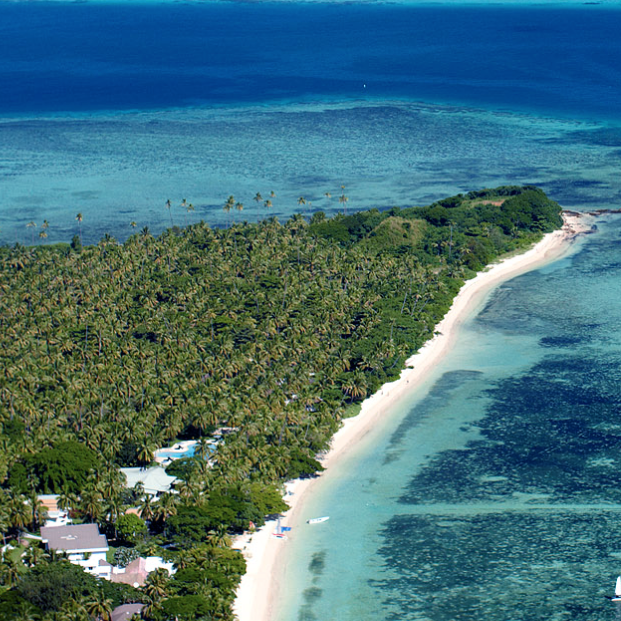 Guests will immediately forget that they are only a short trip from Nadi, as they marvel at dense rainforest ringed by alluring white sands, colourful corals, and warm waters. Castaway Island’s private 4-star resort has worked tirelessly to preserve this tranquil sanctuary for over 40 years. Guests rave about the mouth-watering gourmet pizzas served at the Sundowner Bar & Grill. Tripadvisor reviews often recall fond memories of the great food, tasty cocktails, friendly service, and stunning sunsets they enjoyed here. Pizzas can be boxed up and taken to the beach for the ultimate island sunset picnic. During selected times of the year, Restaurant 1808 is open to provide guests with the delectable and nutritious pacific flavours of Asia and Fiji in a unique beachside setting. Water’s Edge Restaurant also offers magnificent sea views and is the primary resort restaurant open for breakfast, lunch and dinner all year round. Rounding off the culinary choices for guests, the Nuku Marau grill can be found beside the family pool and offers fresh Asian and Polynesian inspired a la carte choices. Movie buffs should not miss the Modriki day trip in which they are taken by speedboat to the island where the Tom Hanks survival drama Cast Away was filmed. Trip guests will be guided to see scene highlights from the movie and enjoy a hearty champagne brunch on the beach and even the opportunity to snorkel. If the exhilaration of speed boating isn’t quite enough, thrill-seekers will never forget paraflying or jet-skiing in the waters surrounding Castaway Island, and kids will love whizzing around the island on the banana boat ride. Whoever said that relaxation is sedentary hasn’t taken a walk (or run!) to the top of the Castaway Island mountain. The reward for all the hard work is absolutely spectacular panoramic views from the top; you’ve never seen an island vista like it! Guests into tennis can then maintain their elevated heart rate with a few lively sets on the resort tennis court. To top it all off, and to really get their blood pumping, guests can take part in Castaway’s own Barefoot Boxing program in which participants shadow box in unison right on the beach. Guest reviews insist that snorkelling trips are an absolute must-do. Inner reef snorkeling is easily accessible and reveals colour and beauty that has to be seen to be believed. Outer reef snorkelling tours are also only minutes away for the more adventurous. Travellers even take part in Castaway Island day cruises and travel to the island just to experience the magical snorkelling to be had there. Castaway Island resort doesn’t take its amazing coral for granted and is working to help regrow the local coral as just one of an array of environmental efforts to help protect their little slice of heaven. Behind all of the wonderful food and terrific activities are a staff team who can only be described as extremely happy, helpful and friendly. They make Castaway Island resort what it is, right from the lovely welcome in Fijian song on the beach, through to heartfelt goodbyes as visitors who have now become friends reluctantly leave. Castaway’s bures (traditional bungalows) all have a distinctively Fijian feel, with traditional thatched roofs, hand-painted tapa-lined ceilings, and natural timber interiors. These spacious rooms become havens to retreat to and relax in after spending hours at the beach or pool. Island Bure’s are just a few minutes from the beachfront and rest amongst verdant tropical gardens, while Ocean View bures enjoy the best of both worlds, being close to the beach while still enjoying the embrace of immaculately-maintained gardens. Castaway’s Beach Bures are something special, boasting uninterrupted views of the sparkling water – guests need only step a few metres from their doorway to be on the beach itself. Just because you have a large family or group, it doesn’t mean you have to miss out on stylish beachfront accommodation. Up to ten guests are provided for by the Family Beach Bure, with the beach and waterfront right on its doorstep. Castaway Island Resort is finely-tuned for providing ultimate romantic escapes for couples. Honeymooners will be in heaven as they enjoy bonus Honeymoon gifts, romantic Mamanuca Island boat cruises, and a water’s edge dinner by candlelight. Wedding packages offer the chance for the dream tropical island wedding that will exceed the fantasies of the lucky couples. The Castaway Island experience is carefully designed to help couples unwind and disconnect from their busy wired worlds, to spend quality time together, enjoying a break away from it all. To help achieve this there are no TVs in the rooms, and Wifi coverage is limited – perfect for workaholics who need a firm helping hand! Couples can enjoy quiet solitude together, or throw themselves headlong into busy activity on and under the water. 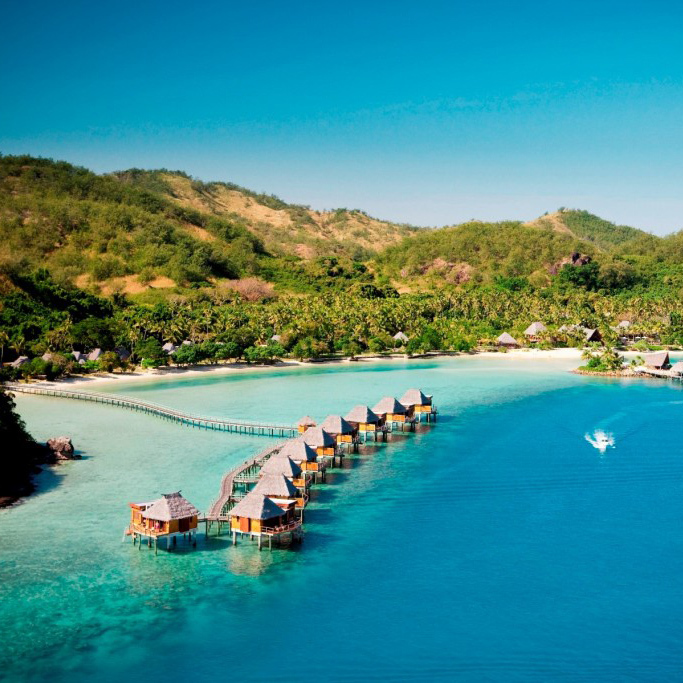 Castaway Island Fiji, is also a popular destination for families, and has received, among many other awards, a win in Luxury Travel Magazine’s Best Overseas Family Holiday category and a ‘Top 10 Fiji Family Resorts’ award from Holidays With Kids magazine . Guests consistently praise Castaway Resort for their excellent Kids Club program, while Castaway makes every effort to offer the complete package for families with such details as offering family bures specifically designed for large family groups and kid-friendly family meals. Moreover, Castaway Island deals include flexible family holiday packages such as the Castaway Five package for families with three children. Guests frequently comment on how good the staff are with children, and it’s all the small details that add up to make a total family experience; the family pool entirely shaded with cover with the adjacent kiosk serving child-friendly food (and don’t forget cocktails for the grown-ups!) being just one example. 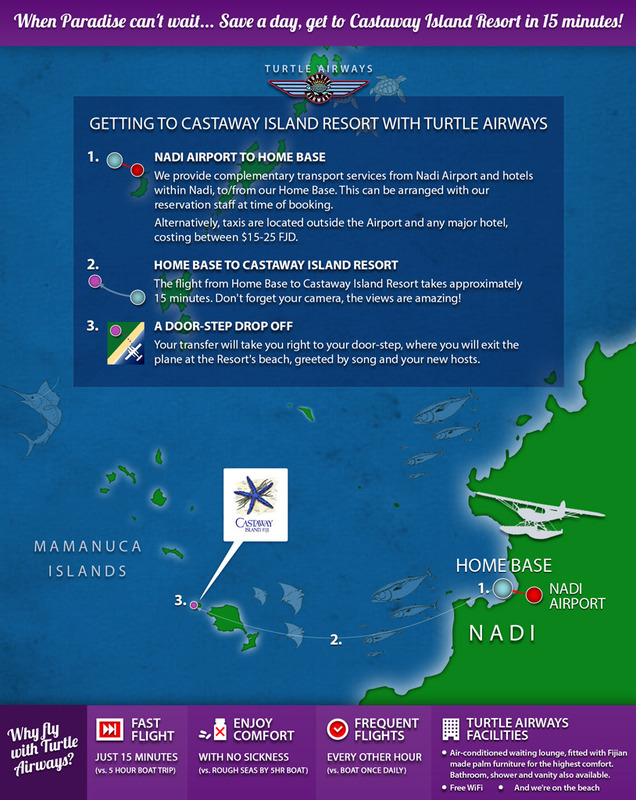 Turtle Airways offer seaplane transfers from Nadi to Castaway Island, providing a beach-to-beach transfer from our Seaplane base on the mainland directly to the beachfront of Castaway Island Resort. Enjoy a quick 12-15 minute flight and frequent connections (2-6 flights per day) and avoid interminably long boat trips when all you want to do is get to your resort in comfort and with haste.